ZANU PF Masvingo Provincial Youth Chairman Brian Munyoro has warned a group of War veterans who staged a demonstration at President Emmerson Mnangagwa's Munhumutapa Offices on Monday telling them that they are not untouchable. Speaking in a Facebook video that has gone viral Munyoro said, "It is shocking to see these War Veterans asking the President and First Secretary of the party 'if we still together'. This shows the highest level of disrespect for the system they belong to." "These war veterans who demonstrated against the President in Munhumutapa Offices with placards covering their faces must know that as the Youth leaugue we strongly condemn them and and assure them that there is nothing that they are going to do to our President. They must stand warned. Be warned!" He further added. 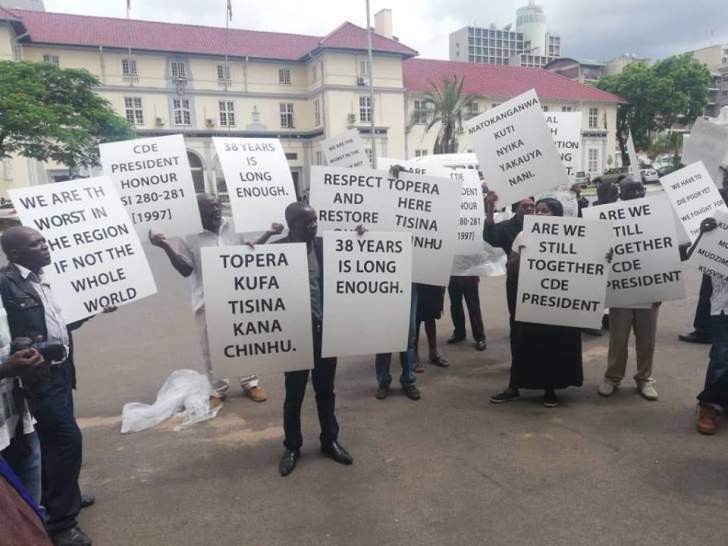 On Monday some members of the Zimbabwe Liberation War Veterans Association faction aligned to Ambassador Chris Mutsvangwa on Monday staged a demonstration at the Munhumutapa offices calling for President Mnangagwa to walk the talk. The war vets carried banners questioning whether the President was still on the same side with them. The War vetarans also called for the ouster of the Secretary General Victor Matemadanda saying he was imposed to lead them and he is not a real War Veteran but a former taxi driver in Zambia. A war has been brewing in the war veterans association pitting Mutsvangwa on one side and Matemadanda on the other.